On December 19, 2013, President Obama granted 8 commutations of sentence. It was the highest number of commutations granted by a president, in a single day, since 1970 - excluding the last-minute clemency caper of Bill Clinton. 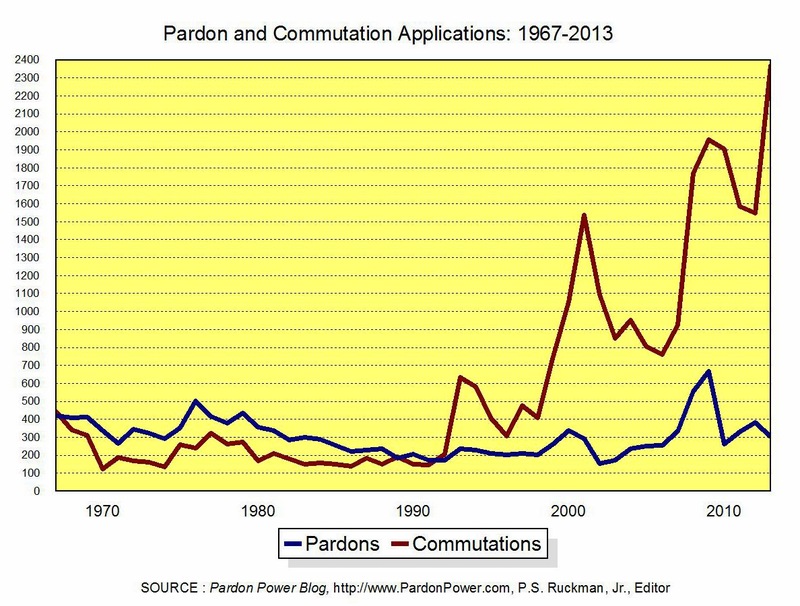 Commutations of sentence have been extremely rare since the administration of Lyndon Johnson. But those in-the-know say hundreds, that 's right, hundreds are likely to be granted before President Obama leaves office. 1. THE CONSTITUTION: The pardon power was given to the president on the assumption that the legislative branch (Congress) and the judicial branch (the federal courts) are not perfect. Anyone care to disagree? 2. EXPERIENCE: Alexander Hamilton correctly observed, in Federalist 74, that the criminal codes of nations have an almost natural tendency toward over-severity - see recent conservative / libertarian commentary on the "over-criminalization" of the law (over 4,000 federal criminal laws), and the expansion of the "nanny-state." For this reason, argued Hamilton, there should be "easy access" to mercy in any justice system. We (Americans) are clearly failing to realize this vision of justice. 3. NEGLECT: Although, today, and in recent decades, acts of clemency have typically been pardons, there was a considerable period of time when presidents routinely granted just as many commutations of sentence, if not more. This changed with the creation of alternative release mechanisms, such as probation and parole, in the early 1900s. But federal parole was abolished in the 1980s. Despite the recent boom in our federal prison population, there has been no subsequent re-emergence of commutations of sentence. There should have been. The ball was dropped. 4. CALM: Everyone agrees that "Law and Order" campaigns of Richard Nixon left their mark on American politics, firmly implanting the retributive justice model in our system of criminal justice, and perhaps discouraging presidents from pardoning (for fear of being lambasted as being "soft" on crime). Trends in crime statistics were truly alarming and the percentage of the public that perceived crime as the "major" problem facing the nation was large. That is all fine and well, but this is now. The downward trends in the most alarming criminal statistics are well known, and Americans are increasingly focused on (more concerned about) economic issues. 5. ECONOMICS: Speaking of economics, prisons are not cheap. Failing prison systems are even more costly. Increasingly, it makes perfect sense to ask, "What are we getting for our money?" If there are high rates of recidivism, why? If we are going to reject concerns about rehabilitation on the front end, can we at least consider the potential benefits of rehabilitation when we actually have someone incarcerated? If what is going on in prisons is not working so well, might it make sense to look for solutions outside of prison? If executives can save money by commuting sentences and employing alternative (and potentially less expensive and more effective) "punishments" ... then what on earth should stand in their way? Be very aware: today, increasingly, liberals and conservatives are seeing eye to eye on this. 6. JUSTICE: The fact of the matter is that our costly prisons are packed with literally thousands of young, first-time offenders, non-violent offenders who are serving lengthy sentences - especially for drug violations. They were sentenced under a law (set of guidelines) that both parties in both chambers of Congress have sense recognized as ineffective if not outright unfair (see Item 1, above). They would not even be in prison right now, if they had been sentenced under current law. Arguably, not a single one of them should spend another single day in federal prison. Their sentences should be commuted yesterday. These are, of course, the kinds of individuals which President Obama's recent commutations focused on. Relatively, speaking, Obama's commutations are little grains, on a tiny tip, of an enormous iceberg. Even if, over the next two years, the President commutes the sentence of "hundreds," it is likely to be a very small proportion of those similarly situated. It is time for the presidency to, once again, become engaged in the business of justice and our system of checks and balances - just as the Founders intended. Let the commutations land. Be at peace with the idea, America. Let the objections and complaints that are surely to follow 1) be filtered for partisanship and animosity toward the president and 2) be contained in the area of discourse where they deserve to be: around the edges, and only reflective of the timing of the President's behavior and / or the quality of decision making in particular cases.